Each month we publish a post like this showing you how CustomFilterz is progressing as a business and the things we have done to get there. The reports help us track our progress while hopefully showing others how to grow a side project into a full-time business. 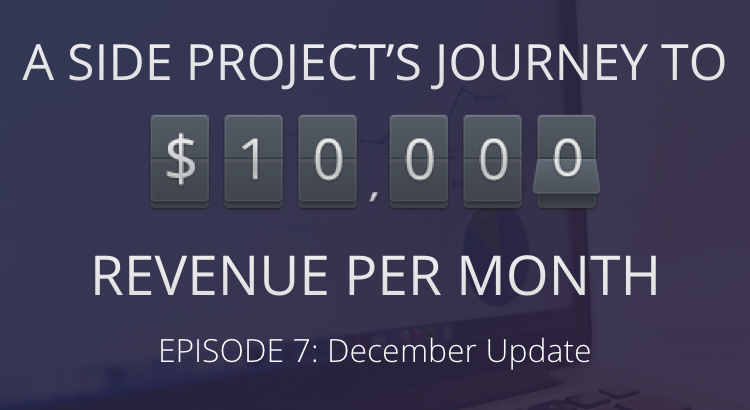 December was an incredible month, with a huge increase in revenue. A combination of big orders and the increased demand over the holidays, lead to an amazing $6,542 in revenue. Our holiday geofilters helped to increase sales by providing an easy way for customers to choose a design and customize the text. We are also working with some marketing agencies on filters for their clients, which generated a large portion of the revenue. The total was a long way over the month’s target of $2,300, and an increase of 194%. Due to some ads we ran for the holiday geofilters, traffic was up to 4,192 from last month’s 3,143. Although this month’s revenue was unexpectedly high, we are confident that we can match in in January, so the goal is $6,600. December was a great month and a lot of progress was made. We also started working on a separate site that will focus on Snapchat marketing campaigns, which will be ready my next month’s update. We are excited for the new year to grow CustomFilterz even further! Thanks for taking the time to read this month’s update ? If you have any topics or questions that you would like us to cover in next month’s update please leave a comment. We would also appreciate your feedback and any tips that you have to help us grow! You can also see our progress along with other exciting startups on Transparent Startups.